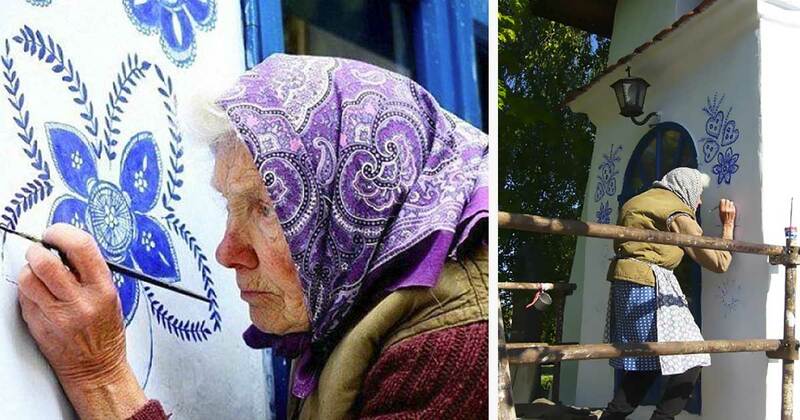 A 90-year-old grandmother is beautifying her small village in the Czech Republic. 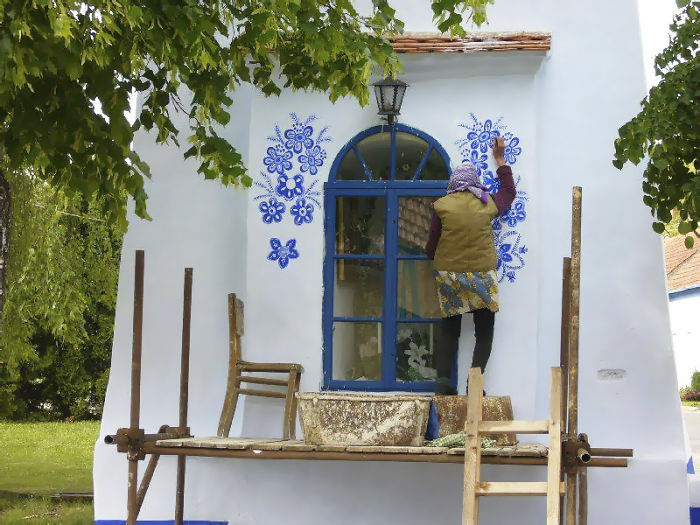 Anežka (Agnes) Kašpárková, a former agricultural worker, has acquired a special pastime in her later years: painting the homes and other buildings in her small village of Louka in southern Moravia. 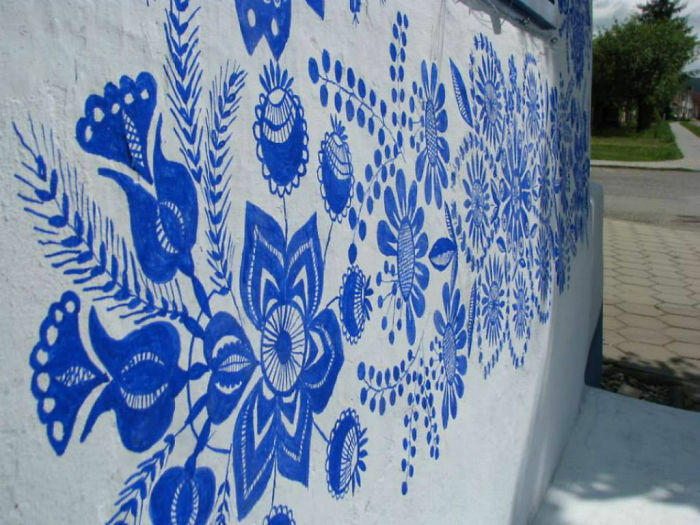 Kašpárková paints flower motifs on buildings large and small in her village in beautiful blue patterns. 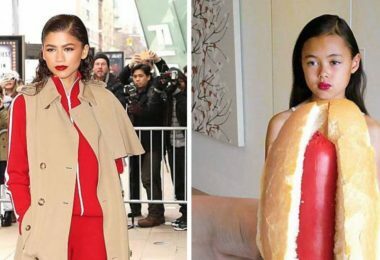 Although she has been asked if she uses some sort of plan, she stated that all the designs come from her imagination and that she starts from scratch each time. 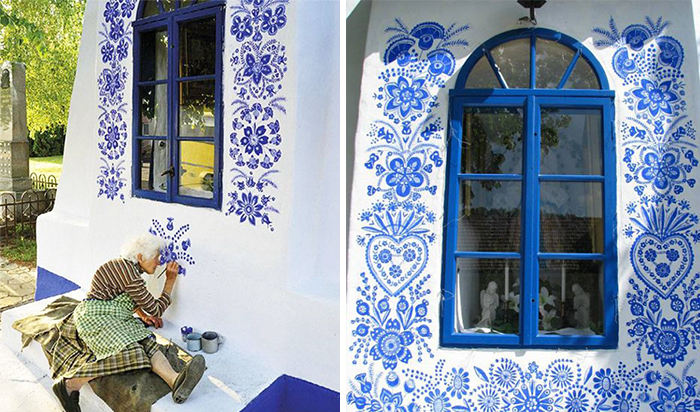 Then, once the design has been up for a year, she retouches it as she continues to add more painted flowers to other homes and buildings. 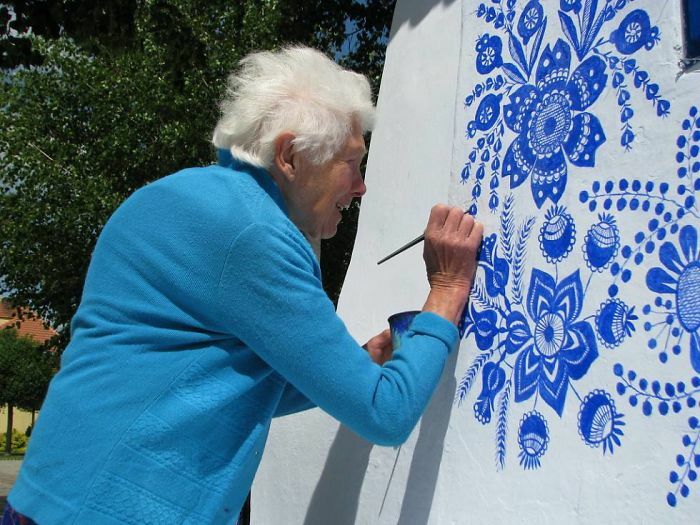 Though her ideas do all come from her mind, these flowers are steeped in quite a bit of history. 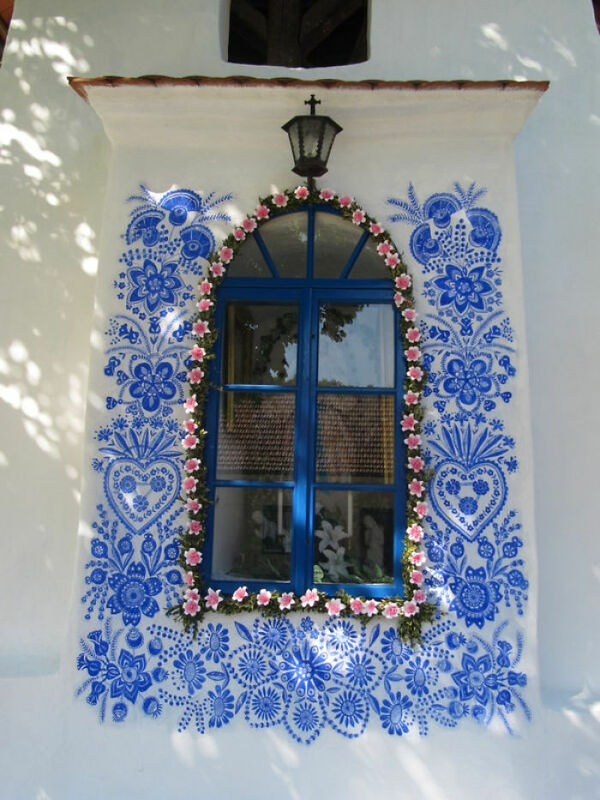 They are similar to the traditional Moravian flower motifs, which makes them both recognizable to those in the town and delightful to tourists. 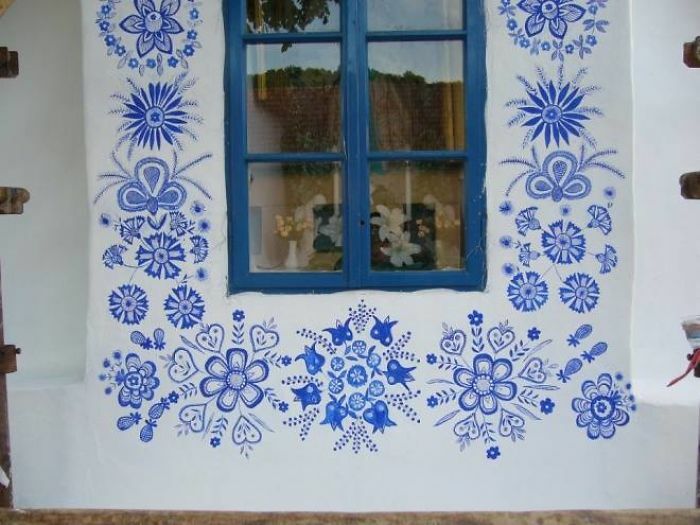 In addition, they also continue the tradition of flower painting on homes, which is perhaps most famous in the village of Zalipie, Poland. 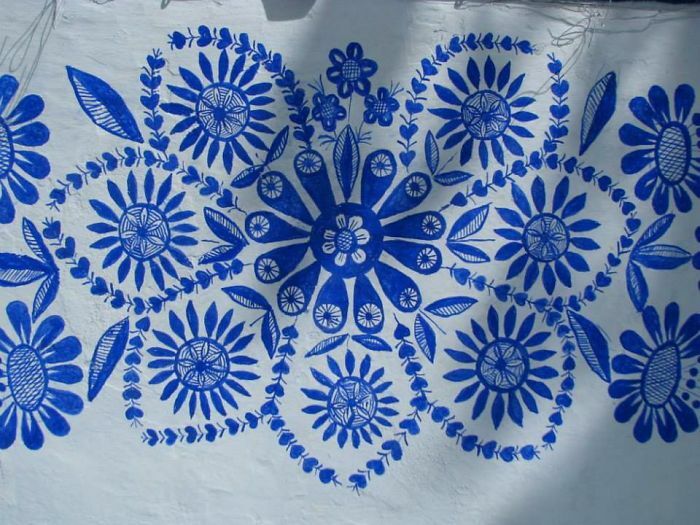 Zalipie’s flower paintings are mostly constructed by the women of the village. 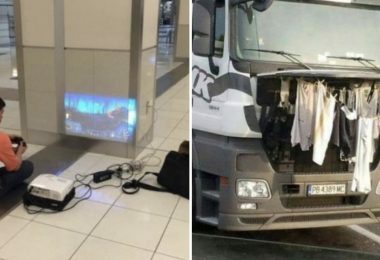 They were once a solution to the unsightly soot that used to cover the homes, even after whitewashing. 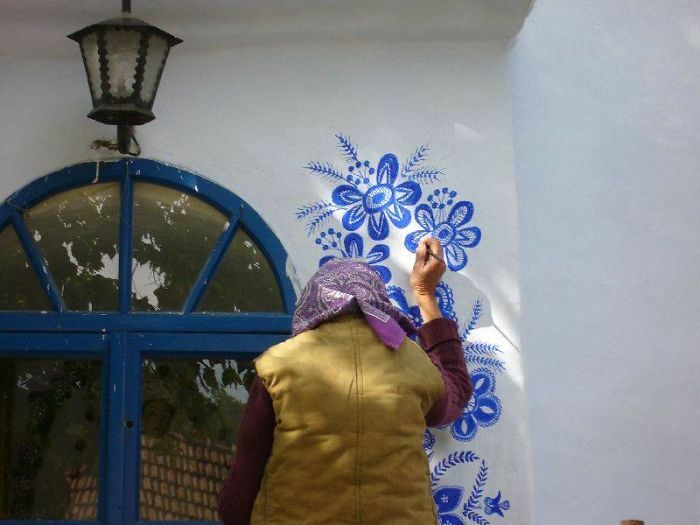 Though this is no longer an issue now that everyone in the town has modernized heating equipment, the citizens of Zalipie still paint beautiful flowers on everything from their homes to their school to their church. 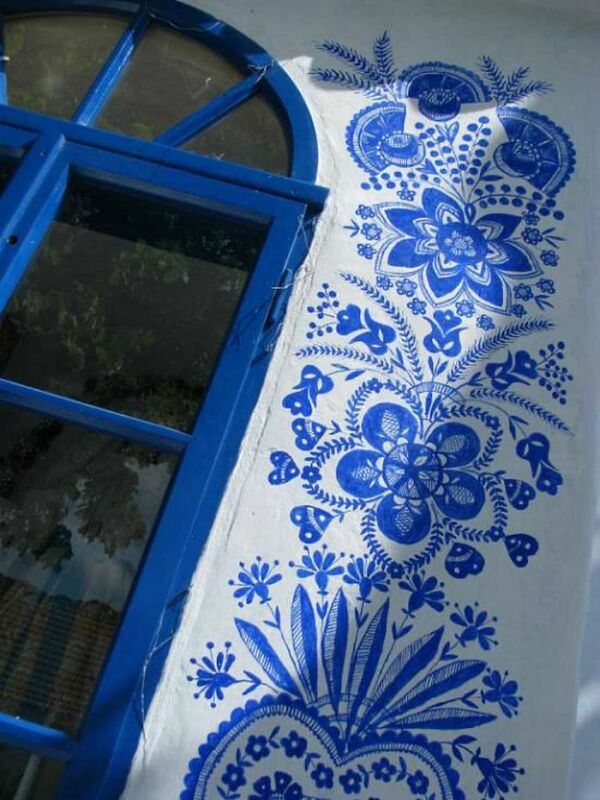 Many individuals also paint the inside of their homes too, a throwback to the actions of their ancestors. 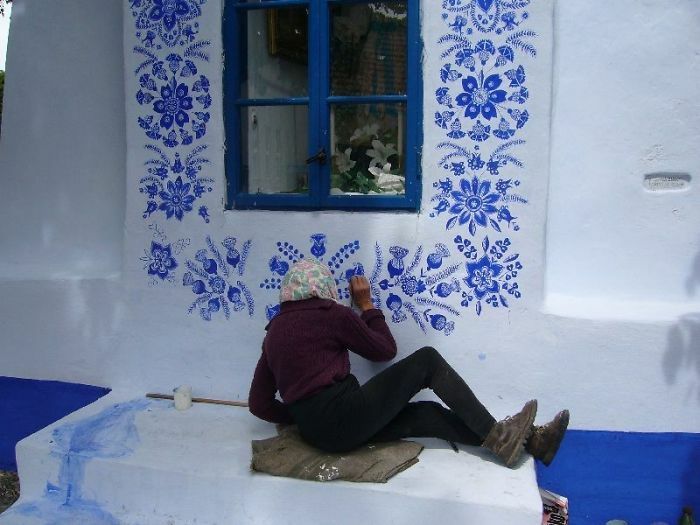 An annual flower-painting contest is also an exciting part of the process, which occurs every year around May or June when the farm work is less intense. 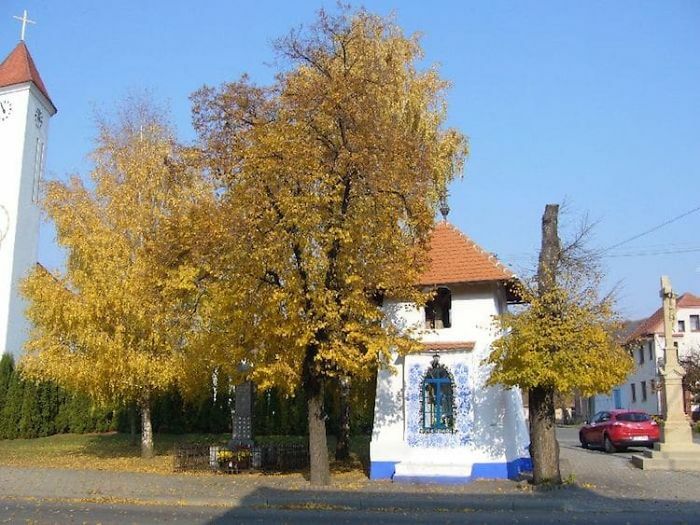 Once created by the Polish government to boost morale after WWII, this contest continues to the present day, giving Zalipie a special look unlike any other village. 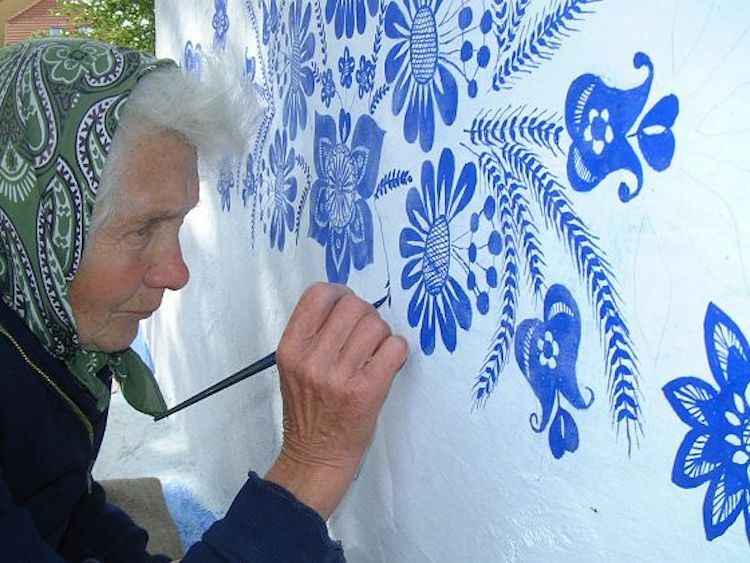 One of the people who took Zalipie’s flower painting tradition to a new level was Felicja Curyłowa. 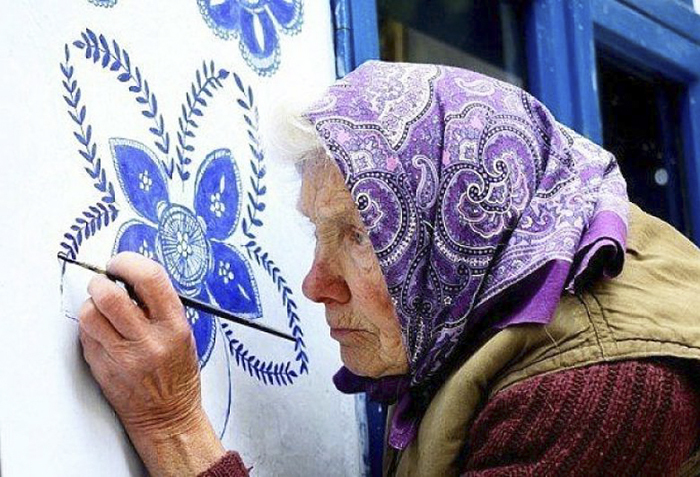 Her home was absolutely adorned with flowers inside and out, and every single surface — from walls to light bulbs to cutlery — sported these paintings. 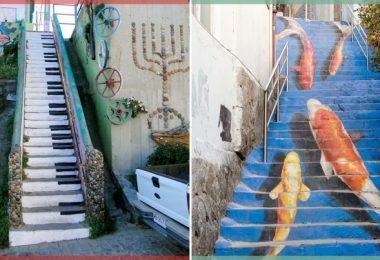 After she passed away, her home was turned into a museum where visitors can always enjoy her lovely drawings. 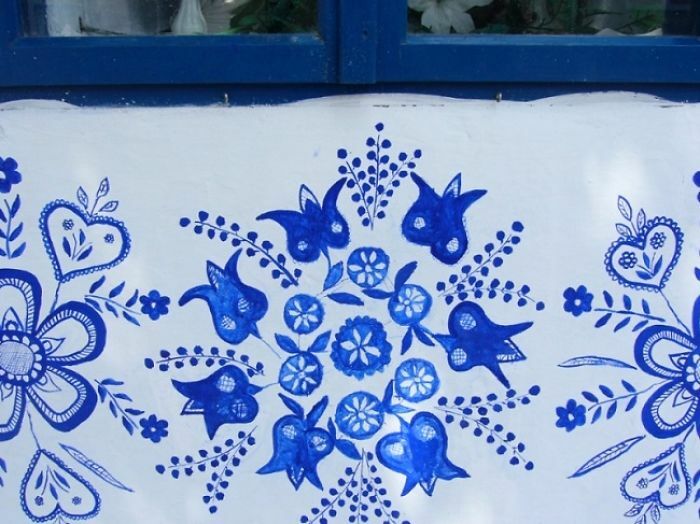 Like Curyłowa, Kašpárková’s paintings have made her famous, but the act of adorning one’s home with the image of flowers in her quaint, little village stretches out long before her time. 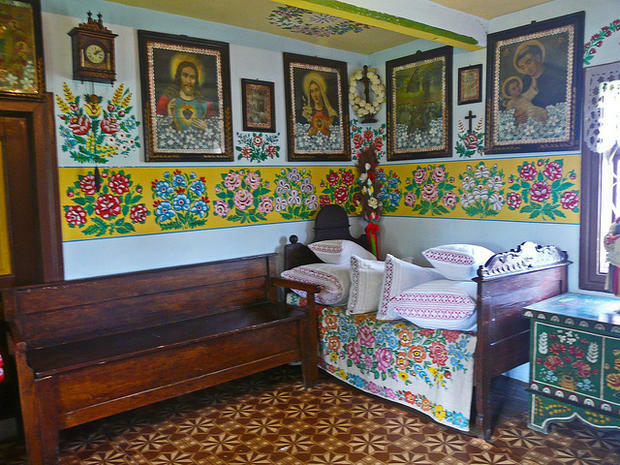 The tradition of painting homes in Louka was also passed down through the years to Kašpárková from other women in the village. 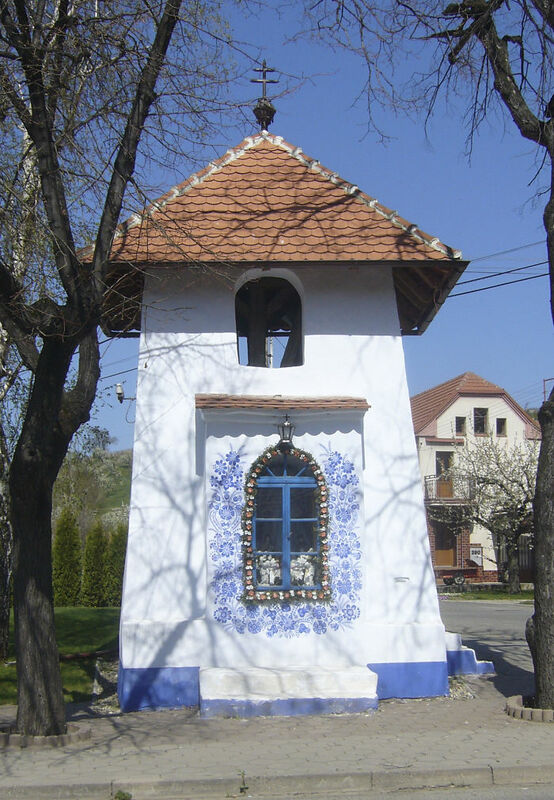 However, Kašpárková states that her painting is something she does not for acclaim or duty but purely because it provides her with pleasure. 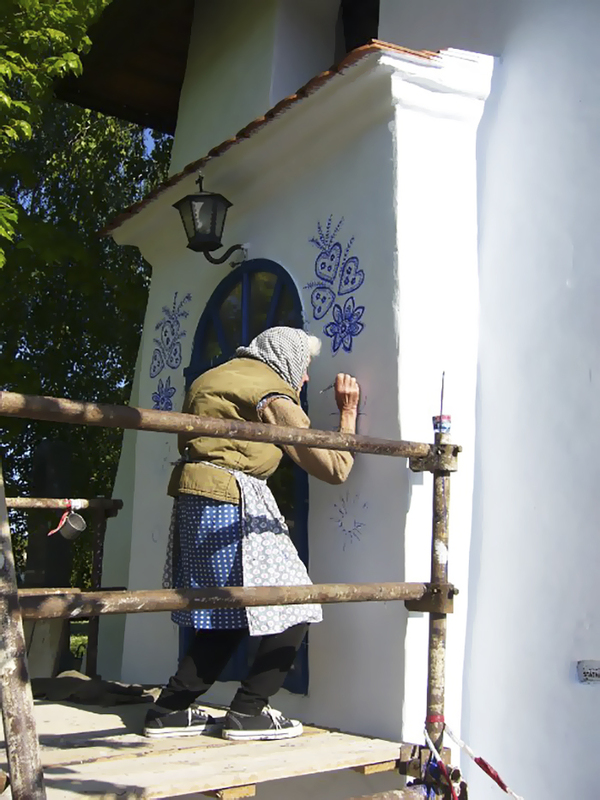 Kašpárková spends the spring and summer painting the homes of Louka. However, she pauses briefly in the wintertime because of the intense cold the region experiences. 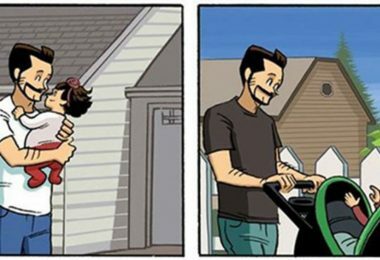 When the weather warms up again, you can see her getting right back to her previous work as well as starting something new. 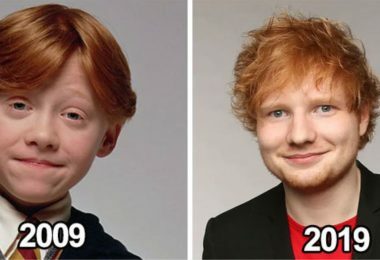 Her story does remind us that age is nothing but a number. 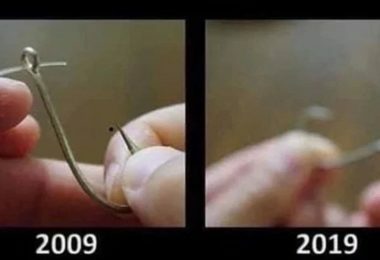 We can all pick up a pastime — new or old — at any point in our lives, purely with the intention of making the world just a little more beautiful. 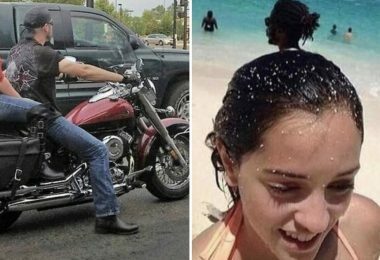 Here are more photos of her and her work!